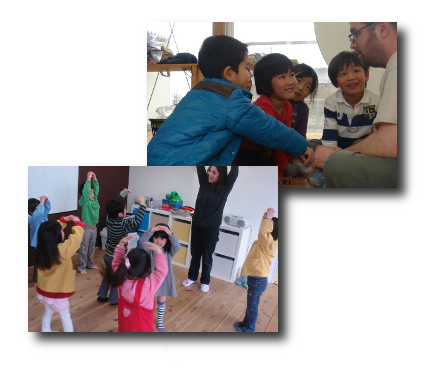 These classes are a great way to expose small children to English for the first time. 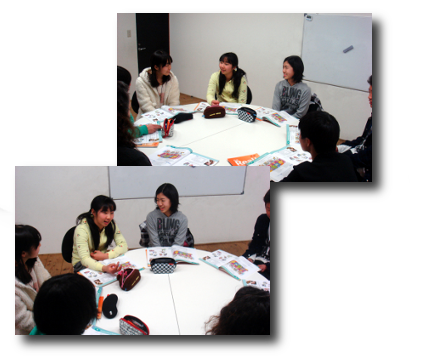 Lessons are taught by a two-person team of a native English instructor and a Japanese assistant. Each lesson is filled with fun and exciting activities, including music and dance, storybook reading, play time, arts & crafts, and plenty of conversation with the teachers. We introduce basic vocabulary, like colors, animals, and fruits & vegetables, and we give our students the tools they need to begin making English conversation on their own. Starting English study at an early age helps kids improve their listening and pronunciation ability, allows them to develop social skills through group play, and prepares them for more challenging lessons when they get older, so these classes are the perfect first step on the road to becoming a great English speaker! Designed especially for very young learners and taught exclusively by native speakers, Chat's preschool English classes help build a foundation in English that will last a lifetime. Like the 2-3 year old classes, these lessons include lots of song and dance, arts & crafts, exciting English-based toys, and other engaging activities sure to appeal to children, aged 3-6. Students begin by learning basic words and phrases in English, and then move on to use more and more complex vocabulary and conversation skills, just like a native speaker! We also start exposing students to the alphabet, giving them a head start on English reading and writing. A combination of vigorous study and exciting play means students will stay interested and challenged by this exciting English language course.h reading and writing. A combination of vigorous study and exciting play means students will stay interested and challenged by this exciting English language course. Help your child succeed in school while learning to communicate in English with Chat's elementary school classes. Native English instructors use a mix of games, group study, and book work to teach students the essential skills of reading, writing, and making conversation in English. Lessons are designed around fun and easy-to-understand themes, like foods, sports, and occupations, that help students expand their vocabulary while mastering the basics of English grammar. Kids can learn to speak like a native speaker, using English words and phrases to talk about themselves and the world around them. Students are also taught phonics, an important skill for improving both pronunciation and academic performance. As students get older, their English study becomes more complex as they master simple concepts and move on to try more advanced material. Chat's "grammar-based" 5th and 6th grade curricula are especially designed to make students competent English speakers while preparing them for the challenges of junior high school English classes. These classes are for experienced English students who want to continue to improve their conversational ability and learn more advanced English grammar. Native English instructors use a combination of fun activities, textbook work, and free talk to help kids learn to speak naturally and freely. 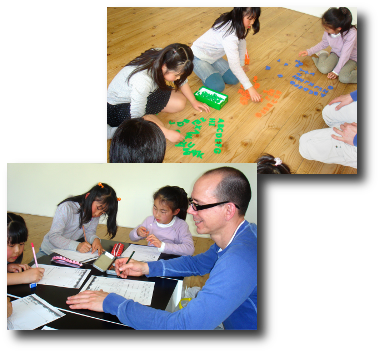 These classes are a great way for students to improve fluency while learning more about the world around them, and they can help students be more successful in school and on the "Eiken" English-Step-Test. Only experienced students with intermediate reading and writing skills and a firm grasp of basic English grammar are encouraged to apply. 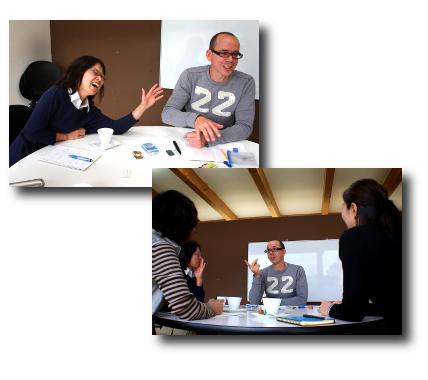 Native instructors lead small groups of adult students in fun and engaging conversation classes. Lessons include a variety of approaches, including mixed media, games, textbooks, and free talk, so teachers are able to give students the opportunity to practice and improve their English in a way that best fits each student's individual needs. Tea/coffee service is included with each lesson. Come see how great instructors and a relaxed and enjoyable atmosphere can help all students, regardless of ability level, become better English speakers! Private and semi-private lessons also available. Especially for parents of children studying English, Chat's special Moms Classes are the perfect fit for moms (and dads!) who want to help their kids be successful in English while improving their own English ability at the same time! 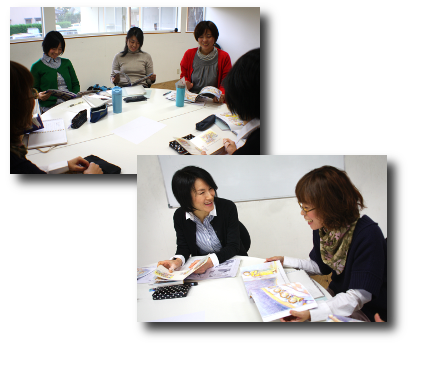 Taught by Japanese instructors, these classes introduce the basics of English conversation, syntax, and phonics in easy to understand, relaxed lessons designed for students with little or no experience. Moms Classes are only taught in the morning, and some classes even give busy parents the chance to bring their babies and toddlers into the classroom, so they are a great fit for nearly everyone's schedule. Want to learn English but are afraid you don't have the time or the ability to succeed? Try Chat's Moms Class and see how easy it can be!